* This rich wholesale bride or bridesmaid necklace set boasts a genuine CZ cushion-cut solitaire framed with delicate CZ's to dazzle to any special occasion. 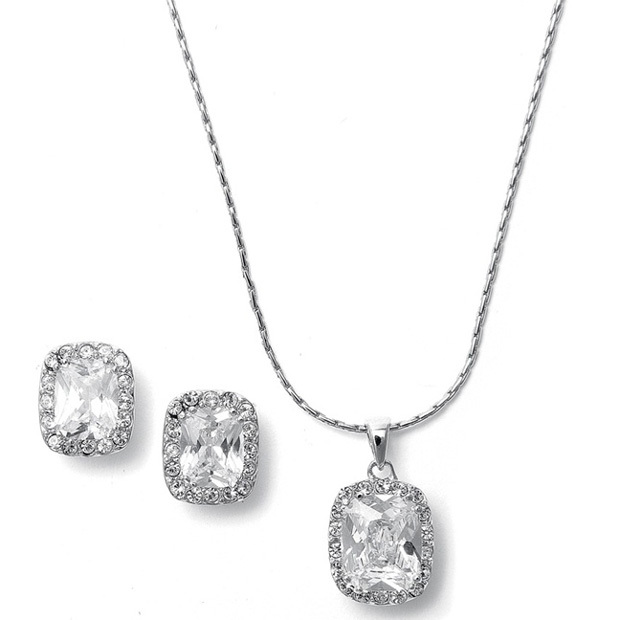 * This graceful wholesale wedding necklace and earring set features a genuine Cubic Zirconia cushion cut solitaire framed with delicate CZ's suspended from a 16" silver rhodium chain. * The matched earrings measure 1/2"h.
* This bridal, prom or homecoming set will add a sophisticated dazzle to any affair at a fantastic price! * The pendant set includes a black leatherette store display easel.